We were asked by Kurt Geiger to come up with a retro TV display for the launch of their new season of products. This is what we came up with! 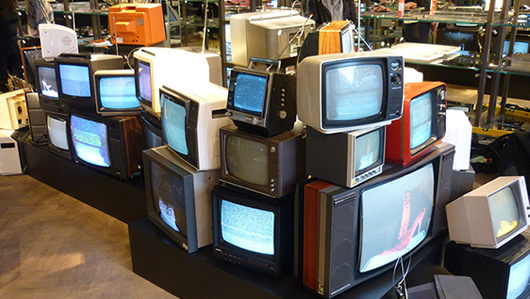 The TV’s were driven from a number of DVD players and MPEG players that fed into video signal convertors that then connected to the various types of TV’s. Old TV’s need RF Signals, newer TV’s have composite video inputs and some have RGB SCART inputs. We have to cater for them all. Some TV’s displayed the same pictures or videos, some had something unique on the screen (either a still image or a video) and some displayed static that sets off the imagery around it. A few were not on at all, which again added to the impact of the ones that were.